What you want to know about allow-unbounded-task-flow-customizations flag in adf-config.xml ? Sharing a tip that I learned recently from my colleagues. In case if your application does not need to support user level customization(design time/seeded or run time) for task flow metadata, here is a tip to improve the performance of your application. Sometimes you may need to deal with unstructured data in your business applications. Wondering what I'm talking about? Let me be more detailed. Consider a scenario where the structure of the data (and even the number of values and their types) that you may store in a column of a table changes for different records based on various business conditions. You cannot always have child table to deal with such cases and also simply keeping them comma separated string may not be really enough to process the data. You may want to store some extra metadata along with each item for processing the data later. One solution for such case is to sore the data as XML or JSON type in database table. This post discusses a possible solution for such use case using JSON. 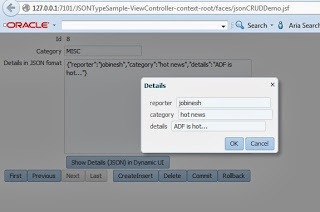 There are few things you may want to do if you ware planing to use JSON in an ADF application. Why validation errors are not displayed in the UI when thrown from an application module method bound to a button? Recently I came across an interesting issue reported related to validation error display. In short, the validation errors associated with an entity object is not displayed in the UI when thrown from an application module method which gets invoked when user clicks on a button. This post discusses the root cause for this issue and a possible work around solution for the same.